The Varsity team beat New Trier Green 3-2 in overtime to capture their second straight Blackhawk Cup State Championship. This season the Varsity team also won Metro North and the Metro Scholastic Cup. The Jr. 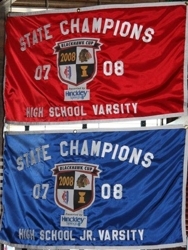 Varsity team beat Barrington 5-4 in triple overtime to capture the 2008 Blackhawk Cup JV State Championship. The win capped off a season in which the team finished first in Metro North and won the High School Invitational Tournament ("HIT") Championship. Click on the links below for more information on each team's exciting season.